Alamo, where have you been all my life? 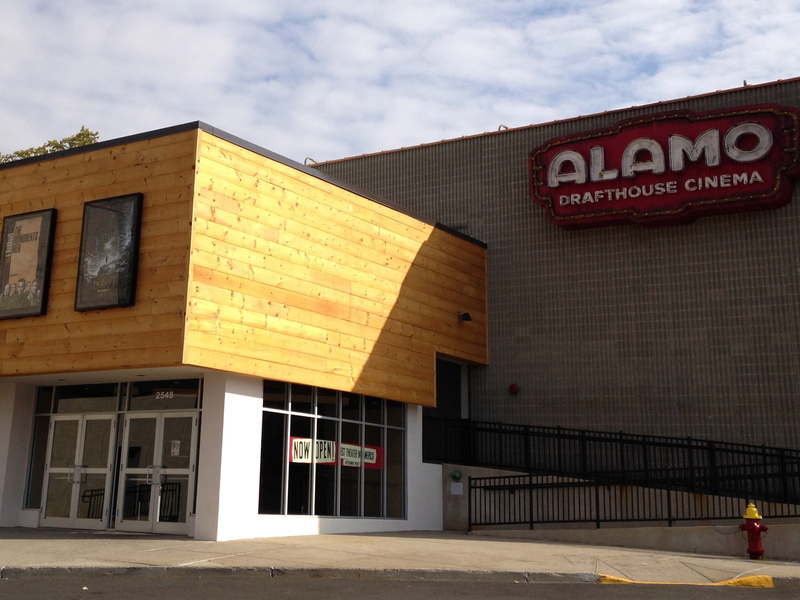 For those of you who haven’t heard, The Alamo Drafthouse Cinema is a new movie theater in Yonkers, NY. And this movie theater is making me very, very happy. I’ve always loved seeing a movie on the big screen- a dark theater, surround-sound, and a crowd of people all around me on the edges of their seats. That love has rubbed off on my whole family, and we go to the movies pretty often. But I have to admit – I’ve often felt a vague dissatisfaction with the whole movie-going experience. Not the movies themselves – but everything else. Just a general feeling that there must be a better way to do it. I mean, I’m not much of a popcorn, candy and soda kind of person…and then there’s the sticky floors…and the annoying advertisements before the shows. I’ve wished my movie nights could be just a little bit more of an “event”. So, what exactly makes this theater so special? Dinner, Drinks, AND a movie – all in one place. The most unique thing about Alamo is that it’s not JUST a movie theater. Alamo offers a full-service, sit down menu, right from your movie seat. The menu offers a wide range of foods, including snacks, appetizers, dinner and dessert. They also have a full, grown-up bar with a wide selection of beer and wine, as well as coffee, tea, and fresh brewed ice-tea and lemonade. A server will take your order right at your seat before the movie begins, and bring you your meal a short time later. You can order more drinks or dessert throughout the movie the same way, never having to leave your seat. A Unique “Pre-Show“. Rather than advertisements before the peviews, Alamo offers a very unique pre-show with clips and outtakes of old movies, usually based in some way on either a specific theme or one of the stars of the movie you’re seeing. For example, the movie I saw starred Tom Hanks, and the pre-show was full of hilarious clips from his early days on Saturday Night Live and some of his old movies. Interesting Programming with Monthly Themes and Unique Movie offerings. Alamo has both first run, popular releases, as well as an interesting mix of old classics and monthly themes. This months theme is “Tough Ladies”, and throughout the month there will be screenings of movies like The Hunger Games, Aliens, Fargo, and Bonnie and Clyde. Actually, it exceeded my expectations! I absolutely loved this theater. As you enter the lobby, it’s immediately apparent that Alamo is trying to be a little more upscale and hip than your local movie house. The wallpaper, lobby decor and lighting offer a bit of an artsy, nightclub vibe. 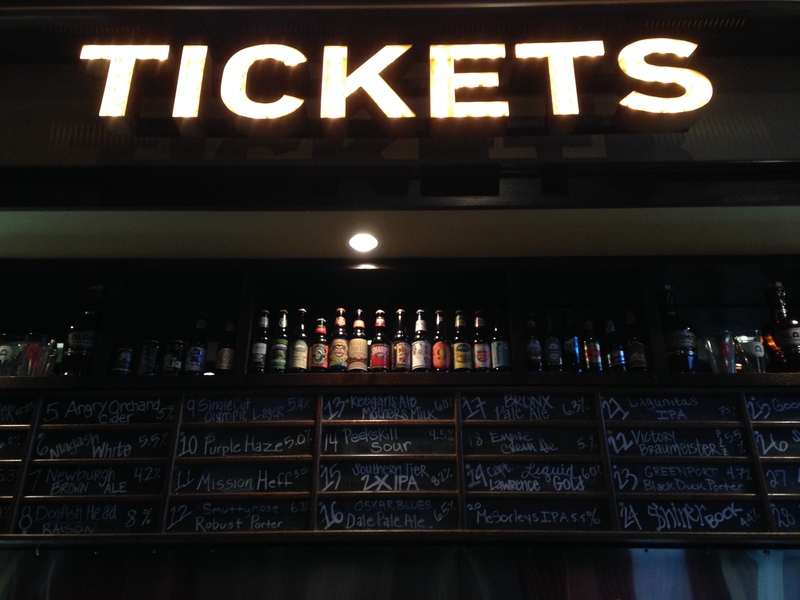 The ticket counter – which doubles as a bar – has stacks of Alamo’s free magazine, devoted to that months theme, and calendars with information about upcoming movies and schedules. Movie night is starting to feel a little more like the “event” I was hoping for. I loved getting served from my (extremely comfortable!) movie seat. Imagine- never missing another moment of your movie for a mad-scramble to the snack bar. The wide selection of choices on both the food and bar menus meant there was something for everyone, including kids. The ice cream shakes are a fun touch, and my favorite offering was the fresh baked, warm-from-the-oven cookies – delicious. The entire staff was exceptionally friendly, welcoming and courteous. This may not impact your movie experience a great deal, and it may not matter much to some people, but it’s the kind of thing that matters a lot to me. I really appreciate sales people and servers who smile, are friendly and are happy to answer your questions. In my experience, this type of customer service is usually not happening at your average movie theater. Alamo did an outstanding job with staffing. 1) Weekends get very crowded. According to the staff I spoke with, there have been weekends where every single seat in the entire theater was filled. Plan accordingly and buy your tickets online. 2) Get there early. Doors open 30 minutes prior to your show time, and for the optimal experience, I recommend you get there are close to that as you can. Relax, order a drink, peruse the menu, watch the pre-show, and submit your order before the previews begin. 3) Good news for Parents of infants and toddlers. Tuesday is Baby Day! This is a big one for new moms who might be starved for some adult leisure time activities. 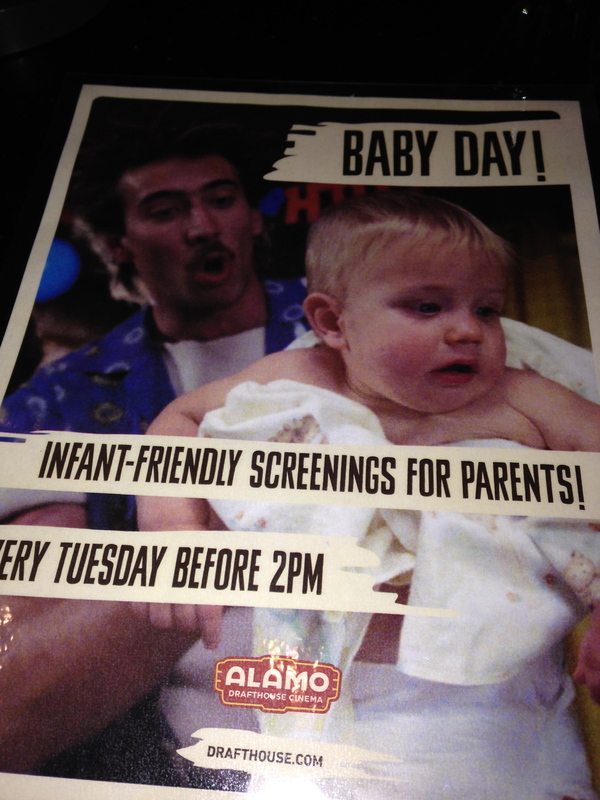 Grab a few other new moms, bring the babies and toddlers, and come in for a movie and lunch. And what If the baby cries during the movie? No problem! That’s what Baby Day is all about. 4) Bad news for teenagers. Unlike other theaters, where unescorted teenagers are welcomed, the policy here is that no one under 18 is permitted without an adult. Your teenagers may have a problem with that, but maybe the food will win them over. Children under three are not permitted in the theater at all, except on Tuesdays, during Baby Day. 5) Know where you’re going. If you’re not familiar with the location, note that it’s difficult to see the theater from the street. It’s located behind the other stores on that local strip of Central Avenue. Look for the sign, not the theater, or you’ll miss it. 6) Order the cookies for after your meal. They bake them fresh when they’re ordered, and they arrive on a warm tray right out of the oven. Need I say more? To sum it up, I’d say going to the movie just got a whole lot more interesting. What do you think? Will you be trying Alamo soon? Thanks for posting this! I had heard about this type of theater but have never been to one, and had no idea that we had one nearby. It might be a fun experience to try out with my son, who is very much a creature of habit (same theater, same refreshments) but willing to try something new when it seems cooler! Rcfermann- the cool factor is definitely high! I think your son would love it- and the fresh baked cookies and ice cream shakes might draw him in, too. I had no idea this existed – sounds fantastic – LOVE the idea of wine at a movie!! Perfect for date-night or girls-night out. Don’t forget the cookies! We love this idea! So much so that my husband went a little overboard and got tickets for the double header this Thursday night. Yes, we are excited to see The Hunger Games (again) and Catching Fire. But Friday morning might not be pretty as we will probably not get home till 11:30pm. I am thrilled that I will not have to cook on a school/work night, yeah!!! I’m so glad to hear you were inspired to visit The Alamo! I know you’ll have a blast. Have an extra coffee on Friday, and have fun!